It's big. Long, but also wide, so it bunches a lot. It has stripes in black. It is metallic and sparkly. It did not cost a lot, because it's Target. It goes with pretty much anything. So, I've discovered that this black lace dress from Target (I bought it sometime last winter, I think?) Is just about my favorite dress ever because I can wear it with a zillion different things and I like how the skirt lays. Too bad that it's kind of worn and been washed a zillion times and it probably won't last much longer. I hate when this happens, because then I have to try to find a replacement, and the new one is never quite as good. 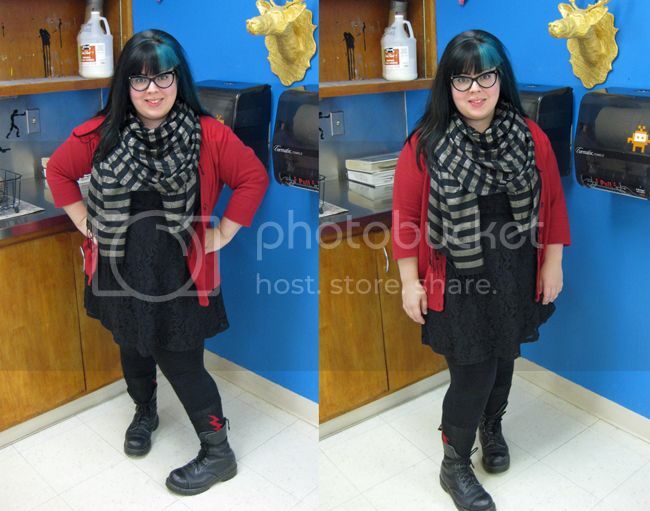 This happened with my black and white striped 3/4 sleeve shirt, and a pair of wedge-heeled mary janes. Ughhhhh. 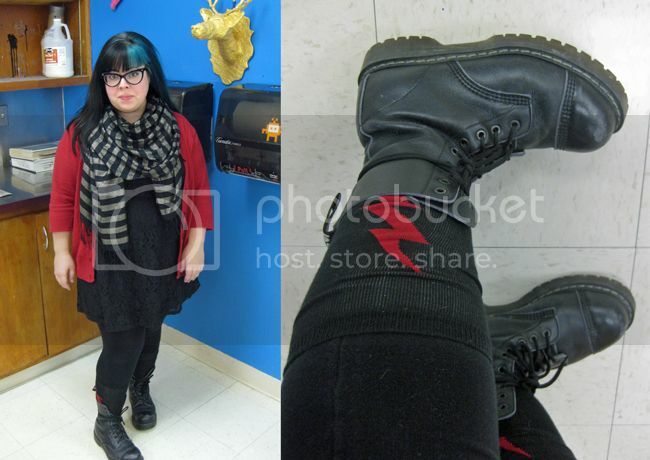 Today I have a fun detail in the form of a pair of my derby socks that are peeking out from my boots. They have red lightning bolts on them. I realized this after I had gotten dressed and picked out the red sweater, so I decided to just go for it. Sometimes I try to disguise my socks or fold them down, but today was hey, whatever. I am always a little sad though that none of the students noticed or said anything about these socks, but it could also be that it didn't seem out of the ordinary to them. 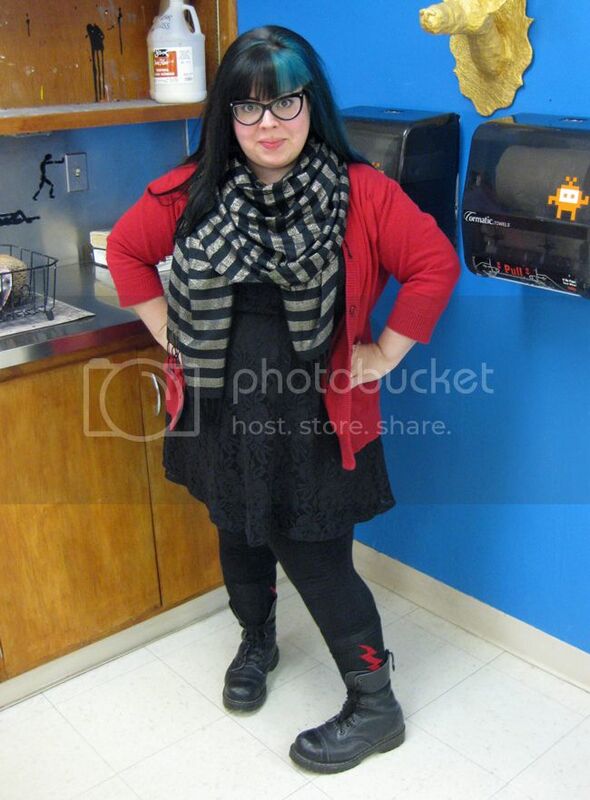 I feel very comfortable in this outfit, because it feels very much like me: the red/black combo, the mostly black "goth" feel, the stripes, the combat boots, and the amount of coverage. I kind of like feeling hidden and covered up sometimes. Even the glasses kind of block my face and I think there's a certain level of comfort in that. Is that weird? I also thought I'd share a fun little crafty thing I tested out at school. 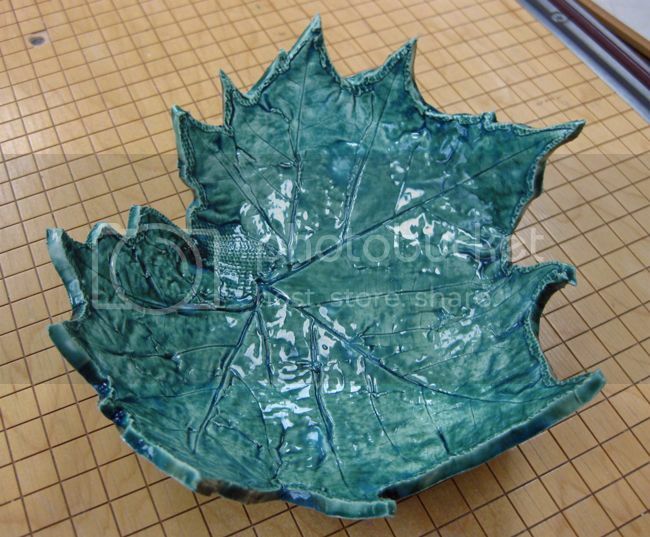 I rolled a giant leaf into a slab of clay, and pressed it into the inside of a bowl until it air-dried. Then, I bisque-fired it, painted it with some turquoise glaze, and fired it again. It made a nifty little decorative dish/bowl. I'm trying to decide if it has any worth in the classroom if students make them (it's mostly a crafty "recipe," as opposed to a full art project), or if I'll just make a few for gifts or something like that. Might be a neat fundraiser for our local charity. I'll keep thinking. You just enjoy. A "Must Have" Vintage App!